Pearls are just not enough, while a full Austrian crystal piece is just too much. This set is a happy compromise. Austrian crystals are clustered upon the button shaped pierced earrings. A matching pendant adorns the pearl necklace. 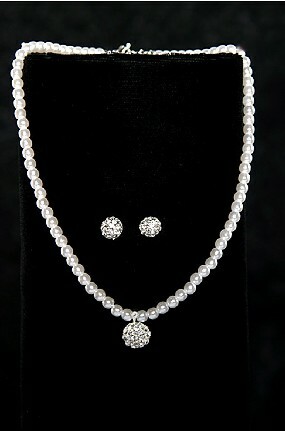 FWO Extras: The Pearl Necklac, with attached Austrian Crystal Button Pendant, adjusts from 16 inches to 19 inches.